Note: This is a special feature post from Mark and Dale from Meet Me OnBoard, the largest LGBT cruise community online. Azamara is a proud partner with Meet Me OnBoard. “Norway is Alaska on steroids,” we heard a fellow passenger on Azamara Journey say. As Captain Johannes sailed into Norway’s Geiranger fjord, a UNESCO World Heritage Area, we knew that statement was spot on. 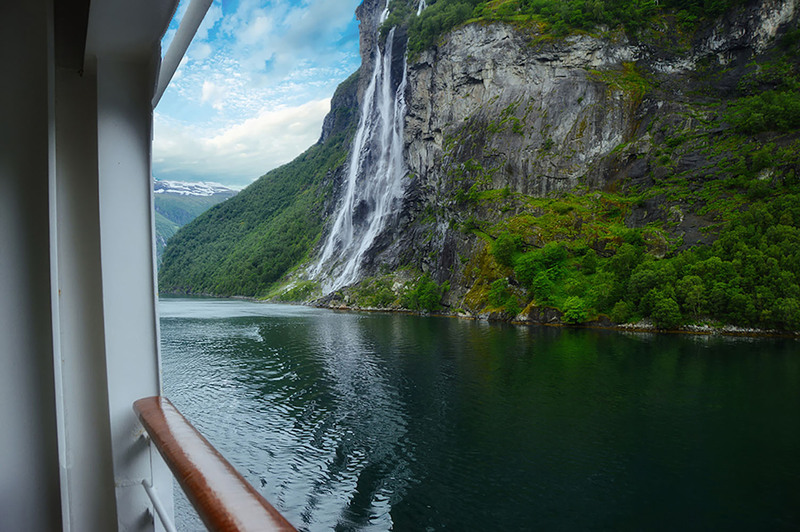 Waterfalls, large and small, roar and tumble hundreds of feet from the mountains above the fjord. The cliff walls are dotted with the occasional farm and we wondered how these farms were accessible, let alone farmable. We were due to visit a small family farm upon docking in Geiranger. Having enjoyed Azamara's culturally immersive shore excursions in the past, we were looking forward to the experience. Once we arrived at the farm, we were delighted to meet Martin, Ingvild, and their three children. They maintain a working farm called a Gjæra perched on a small bit of land clinging to the fjord wall. Martin’s family has lived and worked here on the family farm for the span of four generations. Ingvild invited us into her craft workshop. While sheep bleated outside the window, we learned of traditions that have been handed down for centuries. She demonstrated how she works with sheep skins (with wool intact) to make lap robes for the long Norwegian winter. The wool side keeps the wearer warm, and the hide on the other side gets stamped with ink designs using antique hand-carved wood blocks, also passed down for generations. As we enjoyed a stunning view, the family’s two teenaged daughters played a Norwegian tune on their fiddles. The view from the farm boasts everything that epitomizes life on the fjord: Plump sheep grazing on lush green grass, not-so-distant snow and ice-capped mountains, and the turquoise water of Geiranger fjord. We were treated to snacks produced on the farm. Cured sausage with fennel was flavorful and hearty, especially when served on crisp flatbread with the family’s own sour cream. Martin’s homemade beer was delicious, but our favorite was the fresh raspberry juice made from berries slowly ripened during the long summer days. It was crisp, colorful, and refreshing. Farms like Gjæra, which maintain old traditions of working the land, have become a rarity, we learned. Despite a recent “back to the land” movement, our hosts explained that almost all the mountain farms are abandoned. A non-governmental organization supports the now-empty farms with annual repairs and upkeep. In this way, at least the memory of those farms remains alive. After our farm visit, we returned to Geiranger to relax in the sun and admire the dramatic waterfall that meets the fjord waters near the dock. We enjoyed locally-made chocolates and savored a glass of local beer. We reflected upon the hearty people who founded this town, and those who work high up on the fjord walls, not to mention the men and women who work the fishing boats. Amidst these natural wonders and gracious, friendly people, we once again felt gratitude for the gift of travel. The opportunity to mingle with locals, which gives us an introduction to the local culture of Geiranger fjord is something we’ll always treasure. You, too, can visit the farm during a cruise calling on Geiranger. Click here for more details on the Cruise Global, Meet Local shore excursion that Mark and Dale enjoyed during their voyage.